The purpose of doing this exercise is for you to truly put yourself in the shoes of your ideal customer to understand what motivates them, what challenges they face, and what influences their purchasing decisions; this will help tailor your key marketing messages to position your offer in a way that will best serve them. It will also help assess perspective to ensure that your customer’s attitudes match yours. This is important in order to align priorities, and better position your business resources who may serve one type of customer better than another. It is important to create a buyer persona for every segment in your target audience. Usually not everybody in your target audience possesses the same characteristics. For example, a top executive in the C-suite of a multinational might go through a different decision making process than the owner of a medium-sized local company. The point of buyer personas are that they easy to read and understand. It is a document to get every stakeholder on the same page. For example, development teams need to keep in mind who they are developing a solution for, so that the end product actually meets the exact needs of the target audience. For marketing teams it is important to know who they are targeting to define optimized and engaging messaging and marketing campaigns. If you make use of an external (marketing) agency, a buyer persona can be a great way of communicating what audience the agency will be targeting. Once you have identified the relevant questions, you are ready to start creating a buyer persona. We have created an easy-to-use PowerPoint template so that every ISV can start creating their own buyer personas. You can freely edit the text and choose one of the avatars to personalize your buyer persona. The following questions get you started on creating a buyer persona of your own. What type of company do they work for? What is the person responsible for? What motivates them at work? Do they have ambition beyond their current position? What’s their major fear or anxiety in their role? Where do they get resistance at work? How will you make the person look good? Who do they have to get approval from? What are their key objections (logistics, budget, lack of authority, they don’t think you’re solution will work)? What part of their job can you make easier? What problems can you handle for then? What is the need they are trying to cover? What requirements might they have of your solution? What is hard for them to do themselves/in-house? What are their preferred communication channels? Who do they pay attention to? Where do they get information from? What are their go-to websites, social media or other information sources? 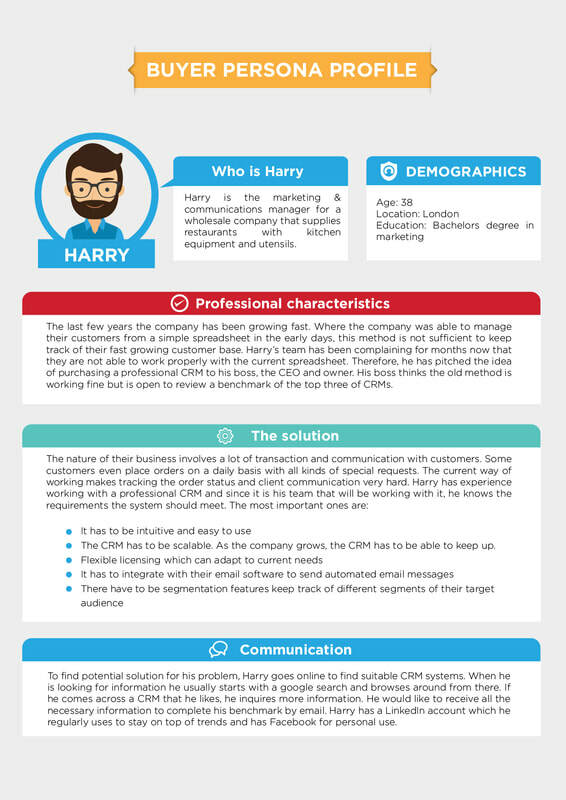 We hope this buyer personal template makes it really easy for you to define your ideal customer, which will be an essential guide in developing your marketing strategy. We’ll send you the editable template by e-mail. Please fill in your details below.